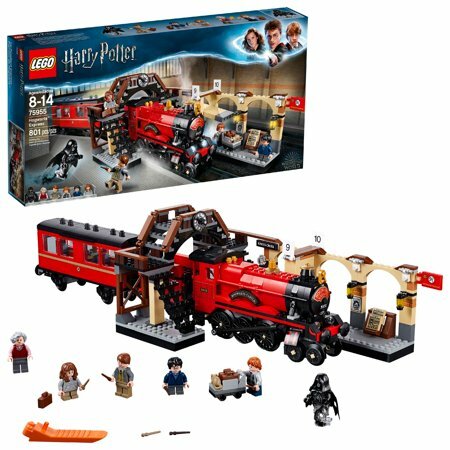 Step aboard the iconic LEGO Harry Potter 75955 Hogwarts Express train from King’s Cross Station. This action-packed building set features a railway bridge with a clock and steps leading to Platform 9&frac34;, moving brick wall entrance, ‘Wanted’ poster and Daily Prophet newspapers, plus a train toy and carriage with 4 seats and removable side panel and roof. Order candy from the Trolley Witch, fly the Dementor into the carriage and recreate fantasy realm scenes from blockbuster Harry Potter movies. This great LEGO Harry Potter gift also includes a Harry Potter figure, Ron Weasley, Hermione Granger, Remus Lupin and the Trolley Witch, plus Dementor and Scabbers figures. I bought this train for my son and myself. He likes it very much. Now we are about to add powder function to it. The train station is interesting too, the only problem is that the train station is a little low for other train (like 60052 train engine) to pass, need to add one layer of brick to lift it. this is only my second train and it's really a beauty. we built it per instructions first to get us started and appreciate it. my 2 year old took to it immediately, even climbing the baby gate to assault the train. because it's not motorized it's a prety simple build, and even a simple review. it's good looking with nice gold accents. the effect the wheels have as they turn is really fun to watch. the coal car is empty and has had several minifigures hidden in there already. the passenger car is simple, but effective. i love that the side can detach for easier access and the candy cart is a decent addition. the rail station is pretty nice looking for the price, and i love the newspaper stand and the "sirius black" wanted poster is cool. the clock's hands on the bridge can actually move and i keep using it to quiz my 6 year old on how to tell time. i have since motorized the hogwarts train. my first train was the christmas village train that i motorized so i already had a battery box and receiver. i bought a medium motor and stuck it in the hogwarts engine with the receiver. the battery box is in the coal car. it was a slight rebuild but worth it. my only gripes about this set are the lack of tracks and even the lack of ease to attach the station to already owned tracks. i'm not too annoyed about the train not being motorized (not everyone wants a motorized train) but making it motorized sure could've been a little easier. lastly, having the magnetic bumpers from coal car to passener car would've been a lot nicer looking. adding two more passenger cars is on my to do list as is upgrading the train station a little bit. Came with a nice instruction booklet, easy builds per bag, very fun to build. Definitely worth the price. 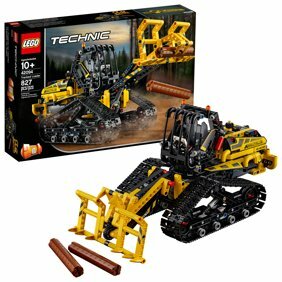 I don't know though if Lego changed its train track design or this set isn't made to fit on the track. However, I only have a few older track pieces. Hey there! Thanks for your review. It's awesome to hear that you've enjoyed the set. We've been using the same train tracks for over a decade now, and this train should work on them A-Okay. I've just tested it out myself and you'll have the best results if you put the train down on a straight stretch (not a curve). You'll also want to firmly guide the train from the engine (not the rear car). This is my First Harry Potter train that i get and it is a good start to make a longer one. But when you want add more rail cars it is good idea to use beams with a length of 5 instead of 3. Using 2 beams of 3 connected is an other option. I wanted to keep the brickbuild train bumpers instead of using the magnetic ones. I build 3 extra rail cars in an other color, but i kept the train bottom like original rail car. I used a Power Up hub and motor from one of my 2 passenger trains which I powered with the older Power Functions. The platform might be have a roof. So I used some not used parts of my tender to make a roof above the platform. I great set. It fills out nicely and adds a pivotal experience from the books, from going through the wall (or not) to ridding the train and buying candy. The only thing is this new series has a lot of repeat characters. I would have liked to seen new characters in this set, so that as you collect all of them you fill out the Harry Potter Roster. I have like 4 Harry and Ron Lego Figures now.